On the whole I dislike decay. My inner perfectionist denies me the pleasure of anything less than pristine, fresh or new. I wish I could be more accepting of senescence, but perhaps this exposes my own fear of growing old. The moment a vase of flowers passes its best I have to be rid of it, so I surprised myself today by gravitating towards a clutch of tiny rambling roses growing along our balcony at Hotel Endsleigh. 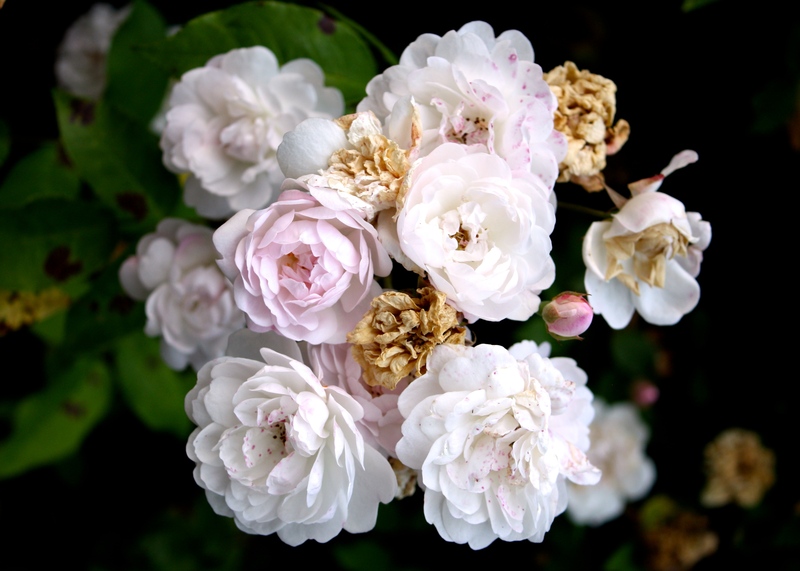 Whether palest pink, sullied white or sepia, the rose’s blooms are divinely romantic. I agree! A thing of beauty! Beauty is always in the mind of the beholder. Think not of death and decay but of cycles of life and renewal. As the petals of the rose fall the beauty of the seed pod is revealed, and when the seed ripens the pod decays to release the seed and the germ of new life. As the old parts of the plant decay nutrients are recycled to nurture the new life. This sounds a bit syrupy, but it is just an exercise in lateral thinking. All very true, and I try to remind myself of this each autumn, but I can’t seem to get over the sense of ‘undoing’ that comes with autumn. Meanwhile I shall continue to focus on the joys of autumn, like colchicums, fiery foliage and cosier evenings. Thank you for the thoughtful comment. Yes, I agree with CroftGarden about ‘Cycles of Life’. But the hard thing is to apply the thinking to your own life.